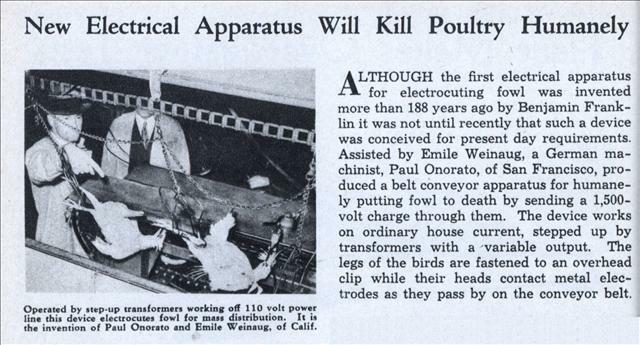 ALTHOUGH the first electrical apparatus for electrocuting fowl was invented more than 188 years ago by Benjamin Franklin it was not until recently that such a device was conceived for present day requirements. Assisted by Emile Weinaug, a German machinist, Paul Onorato, of San Francisco, produced a belt conveyor apparatus for humanely putting fowl to death by sending a 1,500-volt charge through them. The device works on ordinary house current, stepped up by transformers with a variable output. The legs of the birds are fastened to an overhead clip while their heads contact metal electrodes as they pass by on the conveyor belt. This technique is still used today, except a pool of water is used for the lower electrode.